POSH PREVIEW: Peterborough United desperately seeking a return to their best form. Striker Shaquile Coulthirst scored his first Posh goal at West Brom last weekend. Photo: Joe Dent/theposh.com. Peterborough United manager Graham Westley insists his team are about to re-discover their best League One form. Posh travel to lowly Chesterfield tomorrow (February 6) having won just two of their last eight League One matches. They are without a win in three and have lost their last two. The goals have also dried up. 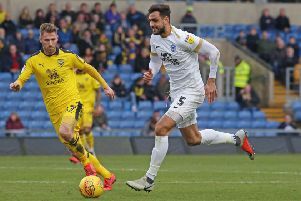 Posh have failed to score in four of those last eight League One games, but Westley believes the performance in the 2-2 FA Cup draw at West Brom last Saturday (January 30) is an indicator of improved League One results. Westley sadi: “We need the move on from where we’ve been to a much better place. We’ve had a little bit of a slip since Conor Washington went out the door, but I think we’re getting over that now as the West Brom game showed. “We’ve started to understand our new strikers and when we recover our potency in front of goal, we’ll be one hell of a force again. “We have good variety in our squad again with several players proving they can play in several different positions. On-loan left-back Harry Toffolo should return to the starting line-up at the Proact Stadium after missing the game at West Brom with a whiplash injury. Veteran central defender Gaby Zakuani is making good progress in his recovery from a severe hamstring injury. He could be back in action by the end of February, a month ahead of schedule.